Darkhorse Entertainment, LLC, invites you to travel back in time to celebrate the high Middle Ages with Robin Hood at the fifth annual Tennessee Medieval Faire. This rugged outdoor festival will spring to life on Saturday, May 25, and run for three weekends, including Memorial Day. The festival is located in Harriman near I-40 just 30 miles west of Turkey Creek. “Help us celebrate our 5th year! ‘Live the Age of Chivalry!’ Enjoy real jousting. Eat a turkey leg. Get knighted. This year we plan on having different themed weekends, such as ‘Warriors’ for Memorial weekend and ‘Time-Travel.’ Come out and have fun. There is something for everyone.” said Barrie Paulson, VP-Manager and Entertainment Director. The festival will include continuous professional PG entertainment. In the tournament arena will be live Jousting and Warriors’ Chess. There will also be interactive comedy shows, puppet shows, Irish and Celtic music, English folk dances, patron costume and talent contests, and interactive costumed street characters. In addition, vendors will be selling medieval crafts, food and beverages, including beer. For those interested in participating as street characters, open auditions will be held on Saturdays, February 9, 16, and March 2, from 2-5pm at 125 Barrie Lane, Kingston, TN. New auditioners are asked to bring a recent printed selfie. All should come prepared to demonstrate their performance talents, such as singing, playing an instrument, telling a story in character, speaking in a European accent, and participating as directed. Adults (ages 18+) are preferred. Theatrical experience and costumes are helpful, but not required to audition. Professional acts can audition by emailing show details and a video link to DarkhorseLLC@comcast.net. The Faire is also seeking vendors to help create the village. Vendors must make and sell their own wares, and all work will be juried to ensure quality and fit. The application deadline is April 6. Medieval crafts may include leather, glass, wood, cloth, metal, henna, face-painting, and hair-braiding. Medieval foods may include turkey legs, gyros, kabobs, loaded baked potatoes, Scotch eggs, bread bowl soup, pastries, fruit, and desserts. Please visit www.TMFaire.com under the vendor tab to download the invitation, application, and guidelines. 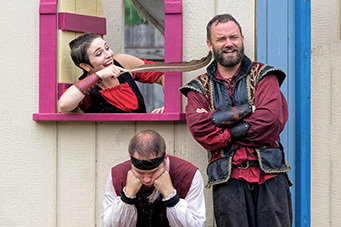 The Tennessee Medieval Faire is an outdoor entertainment-oriented interactive themed festival. Dates are May 25-26-27, June 1-2, 8-9. Hours are 11am-6pm ET. Ticket prices are $17 for ages 13+, $8 for ages 5 to 12, and free for ages 4 and under. Field parking is free. The festival is located at 550 Fiske Road, Harriman, TN. For more information, please visit www.TMFaire.com and follow the Tennessee Medieval Faire on Facebook.